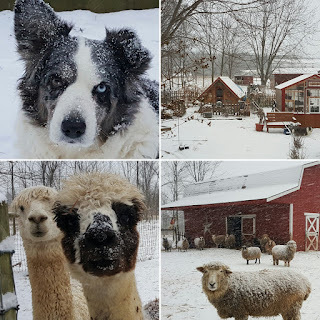 Harvest Thyme Homestead: Enjoying the Snow! Everyone was enjoying the snow today! We are kind of in survival mode here in SW WI with wind chills in the -25 to -30's. BBBRRRR Every morning I am relieved to find everyone standing and looking at the house, watching for me. My chores clothes hang by the wood stove so it isn't so hard to head out at 6 a.m. to do the chores in warm duds to make my critters happy and warm. Enjoy the snow! P.S. Your place and your animals are both adorable!!!!! Sure looks different from this morning. My paddock is a swimming pool. Much prefer snow. Is that Dixie? Someone bite her ear? Love your beautiful pictures!!! Snow is always so much fun:) Thanks for sharing.